pay for ads only when someone responds to them! Sometimes referred to as search engine marketing (SEM), Google AdWords is pay-per-click (PPC) advertising. Google AdWords is Google’s advertising system in which advertisers bid on certain keywords in order for their clickable ads to appear in Google’s search results. The advertiser only pays when someone clicks on the ad. Our team are experts in Google advertising products such as AdWords, Google Display (Showing banner ads on millions of different websites specifically chosen to reach your customers.) and Youtube. DMC has a direct support Google Account Strategist to assist with targeting and efficiency. Google AdWords Pay-Per-Click, or PPC, is one of the most efficient and effective ad buys available today. You pay only when someone who is searching for your products or services clicks on your ad. How does that sound? Google/Youtube provides DMC with direct support from a Google Account Strategist in order to make campaigns super efficient, and up to date with the latest and greatest. Whenever you use a search engine to look for information, you get two kinds of results – organic (unpaid for) and sponsored (paid for) listings. –PLATTSBURGH, NY: Google displays the organic results in the left column, ranking the links according to a variety of factors, and the sponsored listings run along the very top of the organic results and in the column on the right. Advertising in the sponsored listings offers several key benefits. For one, it gets your message near the top of the search results quickly. Trying to get to the top of organic search is called search engine optimization, or SEO, and it involves an ongoing effort that can take many months to produce results. PPC, on the other hand, gets you near the top within a day. Unlike organic search, your text ad will display a specific offer that’s relevant to what the user is looking for, and the transaction only occurs when someone clicks on your ad. Google and Facebook are two of the most popular platforms that offer PPC advertising, and the options for targeting are almost limitless. Search engine advertising is powerful because your ad appears only when people are looking for what you offer. People who click on your ad are ready-made, qualified leads who want to know more about what you are selling. In addition to the world’s most popular search engine, Google also has a broad network of websites you can advertise on, including Gmail and YouTube. 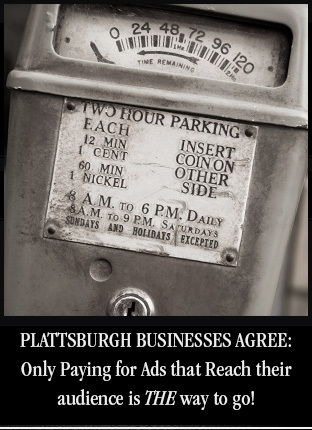 –PLATTSBURGH, NY: The main difference between advertising on search and on the Google Display Network is how the ads are served. You can use contextual targeting tools that match your ad with relevant webpages. For instance, if you sell boating accessories you can display your ad on a website about boating. You can also use various other targeting methods based on audience interest, geography, age and gender. You also have more choices about how your ads are presented on the Google Display Network, choosing from many different ad formats, including rich media banners, video, and text. © 2018 Dodge Marketing, LLC.